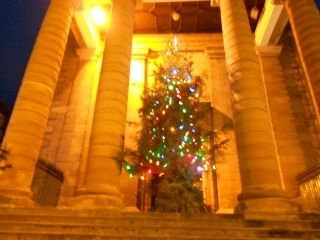 Festive lighting and decorations are provided at Christmas by the Town Council . This includes lights along Marygate, West Street, Castlegate and Golden Square, and seven illuminated Christmas trees from the Morrisons roundabout in North Road, throughout Berwick and Tweedmouth to the Spittal Spa Well. The Council also funds the putting up of lights in Bridge Street, and the array of lights across the Royal Tweed Bridge, which are provided and maintained by Berwick Rotary Club.